Since the release of the very first model in 1999, the LEGO Star Wars Landspeeder sets have become some of the most popular toys for LEGO builders. There have been seven landspeeder sets up to date, all of which have their own charm and unique features. This article aims to enumerate and make a comparison between the best LEGO landspeeder sets by describing each of their design, detailed structure, size, shape, and which minifigures are included. There is also a little bit of their background in Star Wars. At the end of the article, we will try to determine which of these LEGO Star Wars Landspeeder sets is the best. So let’s get in to this. 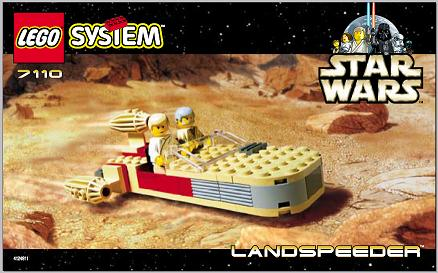 Released in 1999, this classic LEGO Star Wars set features a tan-colored landspeeder with bits of grey and red. It consists of 49 pieces and 2 minifigures: Luke Skywalker (Tatooine) and Obi-Wan Kenobi with light gray hair. In the Star Wars saga, Luke Skywalker was raised as a farmer on the desert planet of Tatooine and owned an X-34 landspeeder that he used for transport. Luke sold the landspeeder when he left with Ben Kenobi to bring the droid R2-D2 to the planet of Alderaan. This landspeeder set weighs 102g with a size of 14.2 x 9.5 x 4.6 cm. This 193-piece LEGO set provides you with the option to create different types of Star Wars staples including a landspeeder and the Mos Eisley Cantina itself. It features a complete cantina set with table seats and other types of restaurant gear. The speeder has two seats, three engines, and a control panel. This landspeeder set also comes with a Stormtrooper, Luke Skywalker, Han Solo, Obi-Wan Kenobi and Greedo minifigures. It depicts the scene when Obi-Wan and Luke went to search for a pilot that would take them to the rebel planet Alderaan. It included a LEGO Dewback as well. The 8092 LEGO Luke’s Landspeeder was released in 2010. This 163-piece classic Star Wars set is small and has an asymmetrical design due to its left engine that has its housing missing. The landspeeder seats two minifigures and has a single steering wheel for controls. At the back of the speeder is a top engine and the small platform that it rests on which are removable, revealing a hidden compartment that is used for storing lightsabers. The compartment is small but functional, and the blades of the lightsabers should be removed from the hilts first in order for them to fit within it. This set includes six minifigures. A Luke Skywalker minifigure with pupils printed on his face is only available in this set. The included Ben Kenobi minifigure also has a face that was slightly redesigned. Both of these minifigures come with blue chrome-handled lightsabers. Unlike the standard Sandtroopers which only have an orange pauldron, this set includes one that has a new, black shoulder pauldron and a new backpack. The 8092 Luke’s Landspeeder set also includes R2-D2 and C-3PO, and a Sentry Droid minifigure that is entirely brick-built and has a clear stand that makes it appear as if it is flying or floating. In the Star Wars story, Luke’s landspeeder was a civilian X-34 landspeeder that was manufactured by SoroSuub. The speeder had holographic displays and used a computer for navigation. It also featured many repulsorlift counterbalances to make the ride easy and smooth. Luke Skywalker sold his speeder in order to pay Han Solo the fare to fly him and Ben Kenobi away from Tatooine in his ship called the Millennium Falcon. 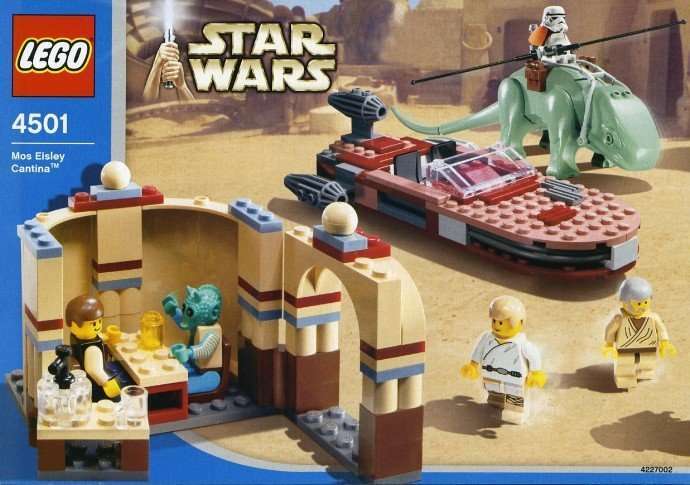 The 75052 Mos Eisley Cantina is a Star Wars set that was released in August of 2014. 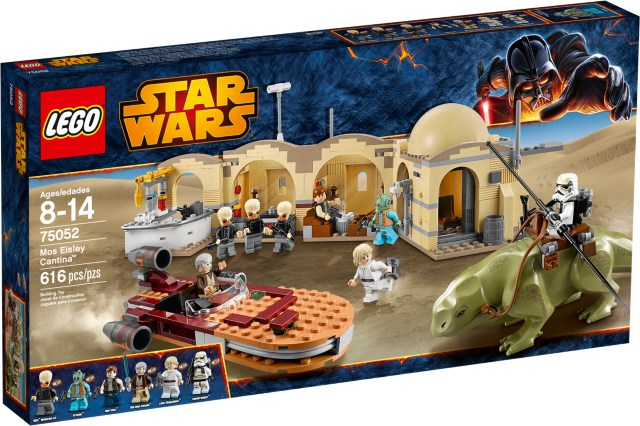 This set features a cantina that can either be closed up or opened out in a line, and a redesigned Landspeeder that has a brand new colour scheme. This set is composed of the main entrance, the bar, and a small alcove to depict the infamous Greedo and Han Solo scene. This landspeeder set includes 8 minifigures with various sorts of weapons and accessories. The Ben Kenobi, Luke Skywalker, Greedo, Sandtrooper, and the Bith Musicians in this set are all brand new versions for 2014. It also includes a Dewback with a feeding area. The Dewback has an opening mouth, a saddle with weapon holster and brick pieces for when the saddle is removed. The Mos Eisley Cantina has a dome roof, an entrance with sliding door and droid scanner, an opening roof, slide-out floors to the middle rooms, a stage for the Bith band, money and bottles, bar with shelves, seats, table and windows. The landspeeder includes a dual cockpit, 3 massive engines, a windscreen and a trunk. The set also comes with weapons that include 3 blasters, 2 lightsabers and a blaster rifle. The accessories included are 3 instruments for the Bith band members and electro-binoculars. 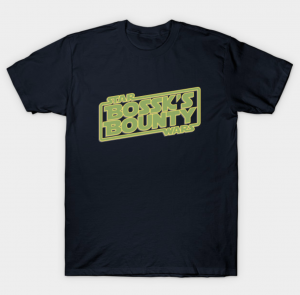 The Mos Eisley Cantina has a size of over 4 inches high, 6 inches wide and 7 inches deep when closed; when opened, it is 4 inches high, 12 inches wide and 4 inches deep. The Landspeeder measures over 1 inch high, 7 inches long and 3 inches wide. The Dewback is over 2 inches high, 6 inches long and 1 inch wide. 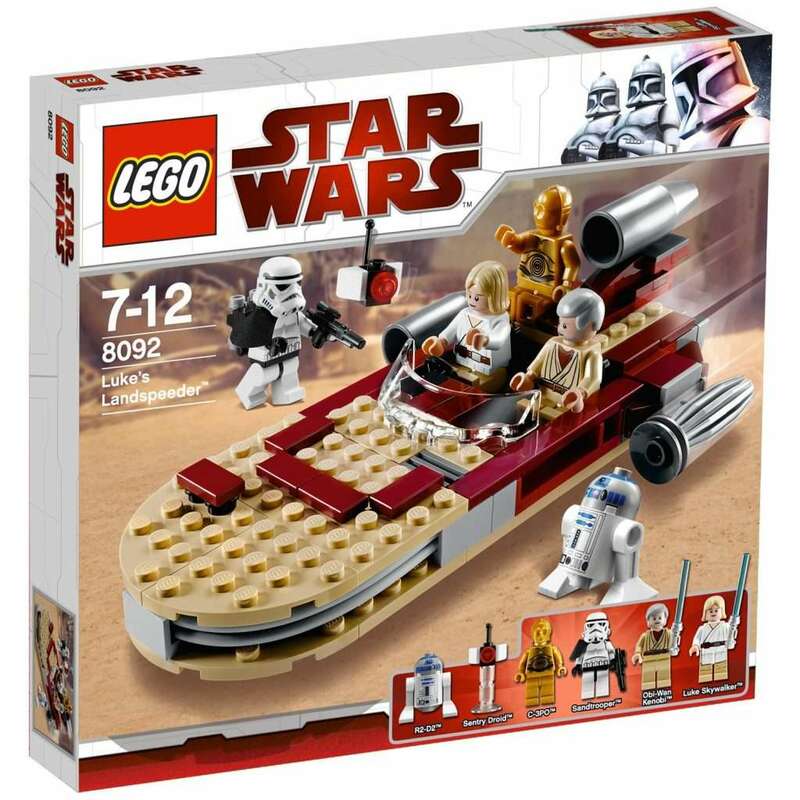 Released in the 2017 Star Wars wave, the 75173 Luke’s Landspeeder contains 149 pieces and 4 minifigures, including Luke Skywalker, Ben Kenobi, C-3PO and a Tusken raider. The Ben Kenobi, C-3PO and Luke Skywalker minifigures are the latest 2015 redesigns. 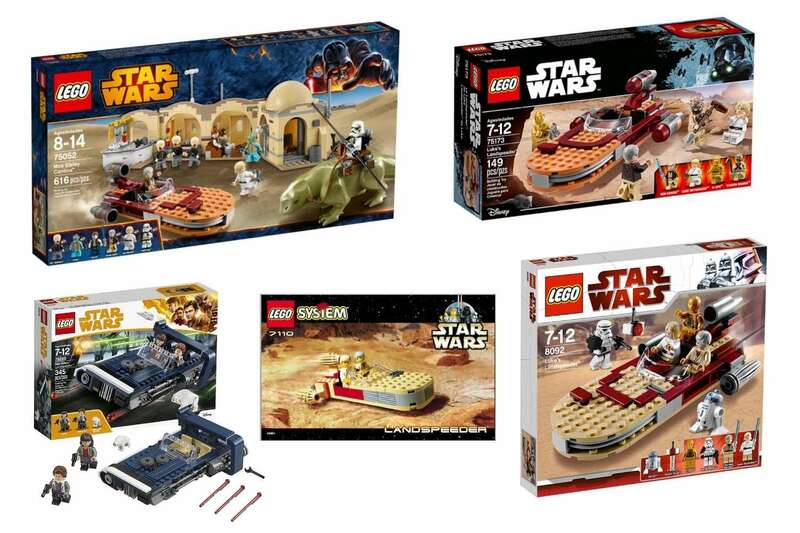 The set also includes a redesigned version of the Tusken Raider and an exclusive Womp Rat minifigure. This landspeeder set’s main attraction is the Luke’s Landspeeder that was redesigned for 2017. Although not very stylish, the X-34 landspeeder is durable and has a maximum altitude of 1 meter, with a usual cruising altitude of roughly 10 cm above ground level. It used three turbine engines to propel the vehicle forward. It also has a repulsorfield generator housing that was located behind the cockpit, and a power circuit that can be found in cockpit’s front. In the story, it took only a short time for Luke Skywalker to repair his X-34 before he sold it to Wioslea. 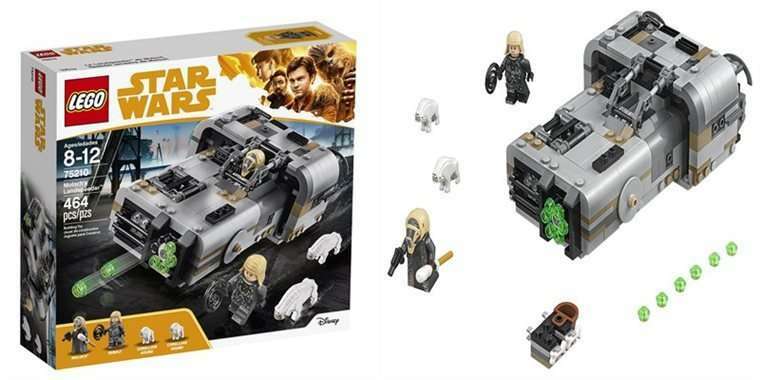 A part of the Solo: A Star Wars Story sub-theme, the 75209 Han Solo’s Landspeeder set was released in 2018. This set includes a rectangular landspeeder which is navy blue and white, with rounded sides and a large boxy rear that is taller than the main vehicle. It also has an open cockpit, an opening hood with storage compartment, a rear storage compartment, hidden wheels and a removable engine. 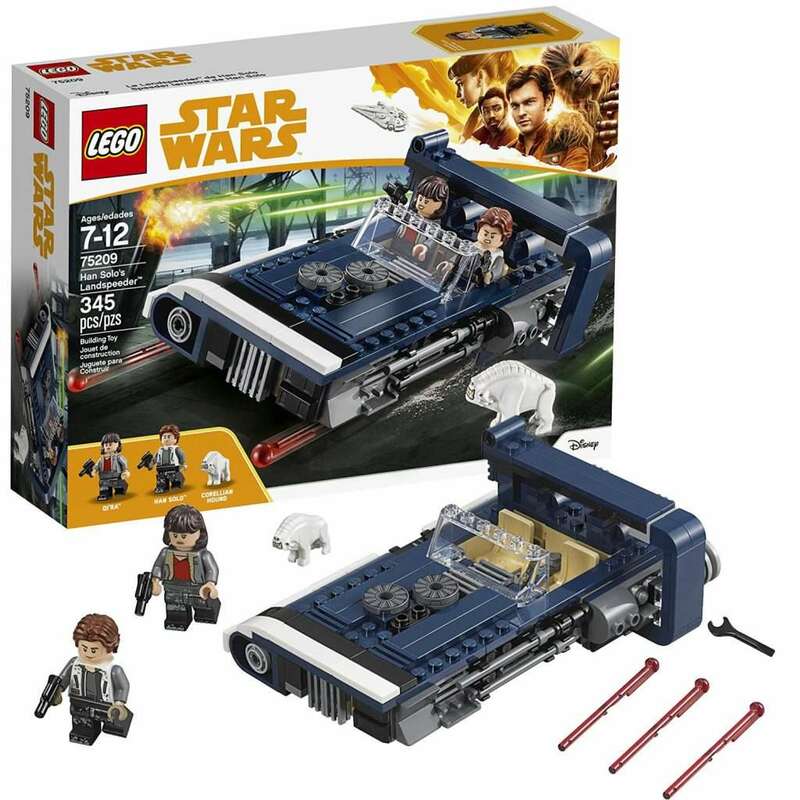 The set includes Han Solo and Qi’ra minifigures, as well as a Corellian Hound figure. This landspeeder set measures over 1 inch high, 6 inches long and 3 inches wide. Manufactured by Mobquet Swoops and Speeders, M-68 landspeeder was very popular among Corellian speeder enthusiasts because of its repulsorlift generator that was easy to modify and overcharge. In the year 10 BBY, Han Solo and Qi’ra used an overpowered speeder of this type to escape the lair of the White Worms and drive themselves to the Coronet Spaceport. Qi’ra was however captured by Moloch, who pursued them, and Han Solo’s landspeeder was likely taken by White Worm thugs. 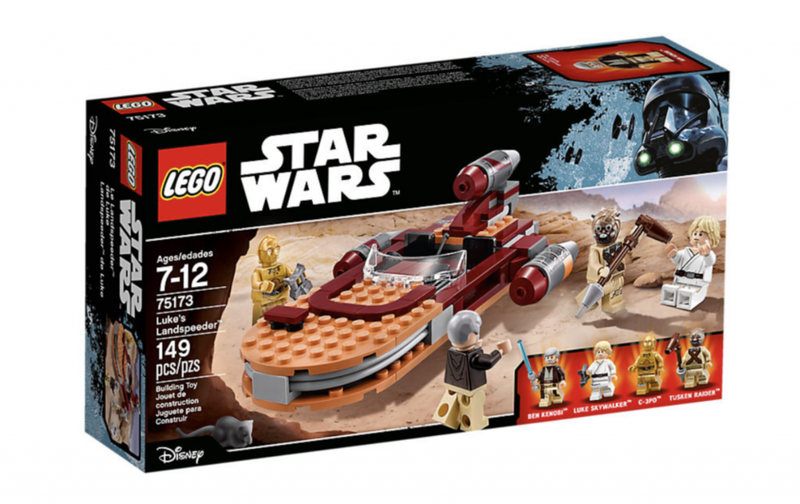 The 75210 Moloch’s Landspeeder is a Star Wars set that was released in 2018. It is under the Solo: A Star Wars Story sub-theme. An unorthodox style of landspeeder, Moloch’s landspeeder is boxy and mostly grey in color with a little bit of tan. It is composed of a rectangular body that is encased in a rectangular thruster frame that also has a rear storage hold. On the right of the front of the speeder is a ventilator grill, and on the front left is a six shooter blaster cannon. The speeder also has a small Corellian Hound cage, hidden wheels, and an open-minifigure cockpit. This landspeeder set includes Moloch, Rebolt and two Corellian Hound minifigures. The accessories include Moloch’s blaster pistol and Rebolt’s whip. Suitable for ages 8-12, Moloch’s Landspeeder measures over 2 inches high, 6 inches long and 4 inches wide. In the Star Wars galaxy, the A-A4B was a model of landspeeder that was manufactured by Trast Heavy Transports. This is the type of landspeeder that Moloch used to hunt down Han Solo and Qi’ra after they attempted to escape from Corellia and start a new life. Moloch was able to capture Qi’ra when he caught up to them at the spaceport, while Han Solo managed to escape the planet. We have looked into the various Lego Star Wars Landspeeder sets, and determined how they are different from each other. As a summary, we can conclude that the 75052 Mos Eisley Cantina is the best when we base it on the number of parts and playability. After all you get a fully working Cantina, a Landspeeder and a newly designed Dewback! However, when we base it on the design and the “coolness factor” of the landspeeder, we could say that the 75210 Moloch’s Landspeeder takes the cake.